Save Tootgarook Swamp and Southern Peninsula Indigenous Flora and Fauna Association, are holding a meeting on Saturday the 21st of April at 5pm till 7pm. Meeting - Community Collaboration 4 removal of the Southern Peninsula PAO/Freeway reserve. Location - 12 Napier St, Rye VIC 3941, (Rye Civic Hall). The purpose of this meeting is to gather/collate information, data, concepts and ideas, effects and ramifications and capture this into a single working document that holds all our views in regards to the PAO/Freeway reserve. (VicRoads, Compulsory Acquisition Overlay), to support and show why this removal should take place. The aim of this meeting is to get us to unite in to a single unit of solidarity, amongst our supports for this removal are who people who hold extensive valued expertise from either the positions they used to work or currently work, or their inherent skills and knowledge. From Biodiversity, through to Agriculture, former VicRoads Officers and Traffic Engineers, to Economists and much more. We have a great community of very well respected and skilled people. We need to pose questions analyse the Strengths, Weaknesses and Threats, and formulate alternative concepts. We have just finished our submission to the Green Wedge Management Plan, having not long finished reviewing the Shire Tootgarook Swamp Management Plan. We were very impressed with the Shire Tootgarook Swamp Management Plan, and having been involved in the process since it's inception, the biggest surprise was coming to submit a submission to the plan and having very little to say. With only a letter of support. To us this means that process has been very well undertaken, and while there was a few points, which we aired at the last stakeholders meeting for the release of the plan and taken on board the overall project has been well done. We have written our submission to the Green Wedge Management Plan and have received a receipt as the 16th submission. Submission close on the 5th of April, and we encourage people to get involved. We are excited to say that residents and community are being invited to have a say on Mornington Peninsula Shire’s Draft Tootgarook Wetland Management Plan from Friday 9 February. At last nights Planning Services Committee Meeting on Monday, 5 February 2018 Council resolved at its to place the Draft Tootgarook Wetland Management Plan on a six-week public exhibition period closing Friday, 23 March 2018. The plan seeks to prevent further degradation of the Wetland, promote its values, recognise its role in the Catchment and broader Port Phillip area, and define the key risks to its values. We strongly urge the community to get involved in this project as we believe it a project that can bring closer together the people of the township and there with people of the rural area, around the common concept of water and the environment that connects us all, the Tootgarook Swamp. We were informed today by one of our local Councillors Cr Celi about a Notice on page 18 of the Victorian Government Gazette. The Shire has made the move by Notice of Acquisition Compulsory Acquisition of Interest in Land to begin the process to publicly acquire the private property at 92 Elizabeth Ave Capel Sound. We are absolutely ecstatic at the decision that has been made, decades of community advocacy going all the way back to the 1990's has been focused on preservation of preserving this land. It could now be said that the former Hiscock estate (Tootgarook Estate) is preserved for all future Australians. Many years the community most recently through our organisation and other prominent local groups, have stood ground to protect these Wetlands from inappropriate development. The last number of years having strategically won a series of complex VCAT cases for a number of planning development and compliance issues joining with other parties and the Shire. The site is an a vital and integral part of the Tootgarook Swamp the largest remaining shallow freshwater marsh in the entire Port Phillip and Western Port region. It contains a large amount of significant fauna species such as, 106 bird species including migratory bird species listed under four international conventions signed by Australia on migratory species. The Japan-Australia Migratory Birds Agreement (JAMBA); China-Australia Migratory Birds Agreement (CAMBA ) and Republic of Korea-Australia Migratory Birds Agreement ( ROKAMBA)"
The site also contains 5 state significant ecological vegetation classes. A big thank you to all the support we have received, help and advice from everyone in the community and to our council for preserving wetland biodiversity for all. There are more updates to come so stay tuned. As promised the latest set of aerial photos from Tootgarook Swamp. We see these images as an important tool in helping monitor change in the wetland landscape and provide a useful tool in seeing changes to native vegetation quality over time, as well as look for any new and emerging weeds. This information also provides a visual dataset that is useful to landowners, managers of land and the community in helping to understand and monitor the Tootgarook Swamp and help aid in protection of the wetland, biodiversity, environmental and manmade assets. We believe that they showcase some important features and may aid in private and public ventures showing that the Tootgarook Swamp is a very important geographic feature that we are blessed to have. The Swamp is approx. 650 hectares in total featuring across multiple land uses such as agricultural, conservation, and tourism ventures, which are all part of it and benefit from the wetlands ecosystem services in a big way. We had some previous aerials done in 2012 - 5 years previous though have increased the extent undertaken in the recent photos. We are offering these photos free of charge, though if you feel that you could help you could do so by kindly donating. We have commissioned another set of aerial photographs of the Tootgarook Swamp this are 5 years since the last series. These images will be available soon, the photos will be available on our aerial library page. Once again its time to join in a fun way help protect biodiversity, aid in management Victoria's frog populations and raise awareness of waterway health issues. Becoming a frog monitor is easy and fun to do, and there is absolutely in need to become a frog expert. The Frog Census Program collects frog data from community members who record their calls at a local waterway. You can record frog calls at any wetland (such as Tootgarook Swamp), creek (such as Chinamans or Drum Drum Alloc), rivers or any other type of waterway (such as a raingarden). The data will inform planning and decision making on our waterway health and will be added to the CSIRO's Atlas of Living Australia and Victorian Biodiversity Atlas to share biodiversity knowledge about endangered species. Your contributions help us to protect these vocal little members of the community, and can provide an indication of water quality in our local waterways. If you missed attending our AGM you can download and view or Powerpoint Presentation here. A video version is also available on our YouTube channel and Facebook page. • Overdevelopment and land capability. • Inappropriate development and subdivision. • Not recognising natural constraints. • Application of overlays such as Cultural and Heritage, Land Subject to Inundation, Special Building, Environmental Significance, and Vegetation Protection. We strongly view this strategy as a critical pathway for the Southern Peninsula (Nepean Peninsula). Our previous letter regarding recent planning changes on the Mornington Peninsula dating from July 2017 can be found here. Once again it's our AGM, so we’d like to invite all our members and public to RSVP (contact@savetootgarookswamp.org) to join us at our upcoming Annual General Meeting Saturday, 9th September 2017 at 10AM. Vern Wright Reserve, Rosebud West. If you wish to join us for a BBQ at the conclusion we ask that you RSVP as we have limited space. Inside the report is many linked files to Sounds and Videos recorded at the site, hoping to provide an interactive experience to the report and location. So get yourself a hot drink, a comfy chair and some headphones (to hear at best quality as some bird calls are hard to hear with background noise/frequency) and immerse yourself in the Tootgarook Swamp. A revised edition of our Swamp Management Guidelines for the Greater Tootgarook Swamp is coming soon, and currently underway as well a report into the monitoring the Australasian Bittern in the Tootgarook Swamp which is in draft form and being reviewed by two fauna ecologists seeking their comments. Save Tootgarook Swamp Inc. has had its AGM and we are still continuing with our efforts to preserve and protect the Tootgarook Swamp.Our AGM presentation can be viewed as a powerpoint presentation or YouTube video. It’s been a busy year for Save Tootgarook Swamp Inc. as we’ve continued with our efforts to preserve and protect the Tootgarook Swamp. Now it’s time to celebrate and discuss our successes and projects of the past year and also to plan out our activities for the next year with our members. Many legal activities related to the Tootgarook Swamp have occurring during this period and we have spent a significant period of time on this. The AGM will be brief debrief of this. So we’d like to invite all our members and public to RSVP (contact@savetootgarookswamp.org) to join us at our upcoming Annual General Meeting Saturday, 27th August 2016 at 10AM. An update from our facebook page - The 7 day VCAT hearing for the wetland development proposal has now turned into an 8 day hearing with a final day scheduled for 29 July to hear the applicants closing submissions and then go through right of reply and conditions and so forth. Not surprising really that it has needed so many days with so many issues at stake in regards to the development and the sensitive wetland environment and the additional complexities of outstanding illegal clearance, landfill proximity, flooding etc. Has been an intense 7 days of hearings with submissions, expert witnesses and cross examinations and we have very much appreciated the huge support, many donations and the many kind words of encouragement from the community which has made the process that much easier to accomplish. We look forward to keeping you posted as things progress and especially ask that you keep sharing the word out about the wetlands plight to as many as possible because it needs the voices of a great many if we are going to turn this thing around and get things going in the right direction for this very valuable wetland and its many inhabitants. We have two press releases, one about a special connection to the Riverina and the other about Tuesdays upcoming VCAT case. Some good news a group of 11 Southern Emu Wrens have been seen and photographed in the Tootgarook Swamp, it is the first time they have been spotted since April 2014, great thing to know that they are still around. ​On the other flip side. We are still proceeding with VCAT applications regarding 92 Elizabeth Ave in Tootgarook Swamp, with application P2038/2015 now withdrawn and P2704/2015 set for a hearing in June. There is also another case P2192/2015 regarding an incomplete and unimplemented enforcement order, we hope to have a media release on this soon. It’s still being a busy year for Save Tootgarook Swamp Inc. currently we are involved in to separate VCAT cases for the Tootgarook Swamp P2038/2015 and P2192/2015, we have also submitted comments for an EPBC referral of 2015/7603. At the same time another organisation has proposed the renaming of Rosebud West to Capel Sound. All local residents are being mailed out about this proposal. We view this proposal as premature considering all the work being undertaken as part of the Ramsar nomination process underway for the Tootgarook Swamp. Many legal activities related to the Tootgarook Swamp are occurring during this period and we are busy preparing for these and as such this years AGM will be brief. So we’d like to invite all our members and public to RSVP (contact@savetootgarookswamp.org) to join us at our upcoming Annual General Meeting Saturday, 28th November 2015 at 4pm. Also, can you help preserve threatened species in the Tootgarook Swamp and become a Defender of Biodiversity. The federally protected Australasian Bittern in the Tootgarook Swamp is in imminent threat at 92 Elizabeth Ave as planning applicant has issued a “failure to determine” to the Shire and triggered a VCAT process. This is heart-breaking news -- but we have a plan. 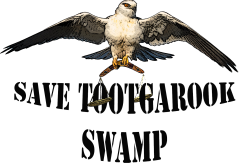 Save Tootgarook Swamp has filed an application in Victorian Civil and Administrative Tribunal to carry out native vegetation which VCAT had ordered corporate developers Watermark Villages to do in April 2011. Instead Watermark have managed to evade compliance with a requirement to restore and maintain the site for 10 years while playing “ping pong” with Mornington Peninsula Shire Council over approval of a Revegetation Plan that was meant to be made within 120 days of the order. The application by Save Tootgarook Swamp is unique in that it seeks to allow someone other than the Council to carry out native revegetation work ordered by VCAT where a developer like Watermark fails to comply. See the front page of the of the Southern Peninsula News edition 3/11/2015. Meanwhile this world class wetland site of State significance has been left to languish for the past 4 years. Sadly however without protection all this is under imminent threat due to the unlicensed and illegal slashing and cropping of native vegetation by these short-term, profit-driven, out of-town developers with no regard for the long-term impacts this has not only on the local community but for all future generations of Victorians as well. We can make this happen though we are kindly seeking donations to help gather enough money to afford the huge amount of research, barristers and legal fees we need to defend our biodiversity. We're confident this can be a strong legal challenge. “By making this application to VCAT we hope to break the impasse and carry out the urgently needed native revegetation works ourselves based on our extensive local knowledge and our comprehensive Tootgarook Swamp Management Guidelines”. Every contribution gets us closer to raising what we need to finish strong and garner further protection for the entire Tootgarook Swamp and it’s biodiversity. Could you help by donating via PayPal, check, money order or electronic funds transfer. N.b. Unfortunately Save Tootgarook Swamp Inc. doesn't have Deductible Goods Recipient tax status, with the organisation only having a G.S.T exemption. Sign our petition also if you haven’t already for our long running campaign to Save, Protect, and Rezone Tootgarook Swamp on the Mornington Peninsula. A massive thank you to all those who have donated so far from the Save Tootgarook Swamp Team. EPBC ref: 2015/7603) These close on the 24th of November 2015. Download our new newsletter, and please get involved with the following. • Facilitate the involvement of stakeholders and interested parties needed for the protection of the Wetland such as: local residents, businesses, land managers, community groups, and relevant Government departments and public Agencies. • Promote a greater understanding of the values and benefits of managing the Wetland and greater catchment. land use and development, occurs in the greater catchment area. • Provide a timeline and plan for the progress and review periods of specific management actions, for community groups, local government, and all other stakeholders to refer too. • Request to become part of the Tootgarook Wetland Management Plan. • Participate in the community consultation activities, from phone calls, meetings, or Wetland events, to be held in the coming months and throughout the course of the Plan development. 2015 April 3rd - ﻿﻿A grassland type that occurs with the Tootgarook Swamp has been declared critically endangered by the federal government and is now protected under the Environment Protection and Biodiversity Conservation Act 1999 (the EPBC Act). Save Tootgarook Swamp pr﻿epared a s﻿ubmission to the the nomination back in September last year. Some sections of this grassland is one that many others and ourselves have been fighting diligently to protect with non-permissible modification that has occurred in two parcels with this grassland since 2009. We are still striving for remediation of these grasslands that occur within the swamp due to their status and importance as habitat. If your interested in the providing hands on continued preservation and conservation of these areas please contact Friends of Tootgarook Wetland Reserves about joining their weeding group. Some good news amendment C188 is now on exhibition. Grab our new newsletter Q1 2015 and also the Western Port Biospheres newsletter who have announced that they are supporting the Tootgarook wetland Ramsar nomination. Thanks everyone who have supported or been involved in the group in this our second year running. We've achieved more than we ever expected to achieve in such a short period of time and it will certainly be interesting to see how this next year will see things progress for the Tootgarook Swamp. Our AGM slideshow presentation with amendments has been uploaded and is available here. So we’d like to invite all our members and public to RSVP contact@savetootgarookswamp.org to join us at our upcoming Annual General Meeting Sunday, 5th October, Vern Wright Reserve, Rosebud West. 2014 August 24th - Southern Rural water have released the Port Philip and Western Port groundwater atlas. It provides comprehensive and easy-to-understand information about the groundwater cycle and aquifer layers, how groundwater is used in the region, and how it is managed. The Tootgarook Swamps groundwater interaction is shown in this atlas. 2014 August 21st - The Mornington Peninsula Shire at it's next meeting has an item regarding the Tootgarook Wetlands Strategy – Review of Planning Controls. The meeting is for Monday the 25th of August 2014, the agenda can be found here. Save Tootgarook Swamp has released version 1 of the "Swamp Management Guidelines for the Greater Tootgarook Swamp". I would just like to say a big thank-you to all who had input into its creation and refinement over almost the last year and a half. We will be occasionally still revising these guidelines as more information and research comes available such as southern rural waters Port Phillip and Westernport Atlas and the Mornington Peninsula Shire Councils Tootgarook Wetland Strategy. Input and feedback is always welcome for future revisions. A large development proposal in the Tootgarook Swamp which was due to go before VCAT next month has been withdrawn by the developer. This was one of many threats currently facing the Tootgarook Swamp's future and though this one is temporarily off the agenda we still have many encounters to face before the swamp inhabitants can breathe easy again. On a positive note the local Shire council report into the Tootgarook Swamp will soon be presented to Councillors. The information in this report will help guide the decisions of Council on the swamp and form the path which is best for the Tootgarook Swamp. For our part we have high hopes for this report and are confident that the Council will makes the right decisions, decisions which the local community have long desired for this beautiful, fragile wetland. Thank you for your continued support and don't forget to share the petition because the struggle is far from over yet, but things are definitely going in the right direction as long as we keep on pressing for it. Thank you for standing with us on this issue. The Save Tootgarook Swamp team. Grab our new newsletter Q1 2014. We are currently on our Final Draft of the "Swamp Management Guidelines for the Greater Tootgarook Swamp". It is not to late for final input and request all those interested to be involved. Save Tootgarook Swamp has been undertaking preparation of submission to support the councils decision, any community input is most welcome. Please contact Save Tootgarook Swamp if would like to help. On the 16th of December the Mornington Peninsula Shire Council rejected an infill development on St Elmos island, within the swamp. Shire minutes can be seen here. Download your free biodiversity poster 'Help Preserve Australia's Wetlands' A0 size. We have been made aware that the application of P12/0527 – 9 St Elmos Close, Rosebud West which was to be considered by Council at the Development Assessments Committee Meeting on 21 October 2013, has been withdrawn temporarily from council to return at a later date. We will keep you informed of when it returns. Guidelines for the Greater Tootgarook Swamp". We invite members of the public to positively participate with, input, feedback and comments. over the next 2 months. Save Tootgarook Swamp has created these guidelines to help the community and land owners understand and provide guidance in terms of management for the swamp and surrounding wetland remnants. We hope for a final draft in late December or early January 2014. Save Tootgarook Swamp is updating some website features with large updates of two pages, our fauna page, and our flora page. Our new flora page is going live, and we invite you to join us as we add photographs to each of the plant species in the list, with varying shots of each plant, providing a source for the community to use as a plant ID guide, for example out on your mobile phone. Our new improved fauna page should be going live within the next few weeks. 2013 September 28th - Posted our AGM minutes and presentation. Outing the past year and future issues facing the swamp. 2013 July 28th - We are holding our annual general meeting on the Sunday 25th of August all members have been contacted via email and the public is welcome to attend. Please email contact@savetootgarookswamp.org for more details. 2013 June 15th - We have started a project on the Bowerbird website, come and join in the action, with place to share and discuss Australia’s biodiversity. 2013 May 10th - Save Tootgarook Swamp website launch. We hope you enjoy our website, though it is partially still under construction we encourage you to have a good look around and thank you for visiting.